In 2014, Startupboocamp Berlin accelerates a new class of startups and focuses on ‘Smart Transportation & Energy’. Its sponsors are Cisco, HERE, Castrol innoVentures, Siemens, Bosch, EnBW and Mercedes-Benz. I am super excited that I am part of it on a daily basis. Thanks Alex Farcet for this great opportunity! I coach each team in running lean, lean startup, customer development, startup sales and marketing (AARRR). I also bring in my own experiences as I went through Startupbootcamp in 2012 accelerating Spotistic. Startupbootcamp is a 3-month acceleration program that ends with a demo day. A chance for each team to pitch their business to 500 selected top angel investors and venture capitalists for funding. The program’s main strength is its family character in which entrepreneurs feel save to screw up, learn and move on. It’s like a circle of trust. Entrepreneurs can stop spending their energy to hide flaws and failures as they normally do when they talk to investors and clients. For entrepreneurs, it’s very important in their early startup steps to have mentors and advisors who they can fully trust. 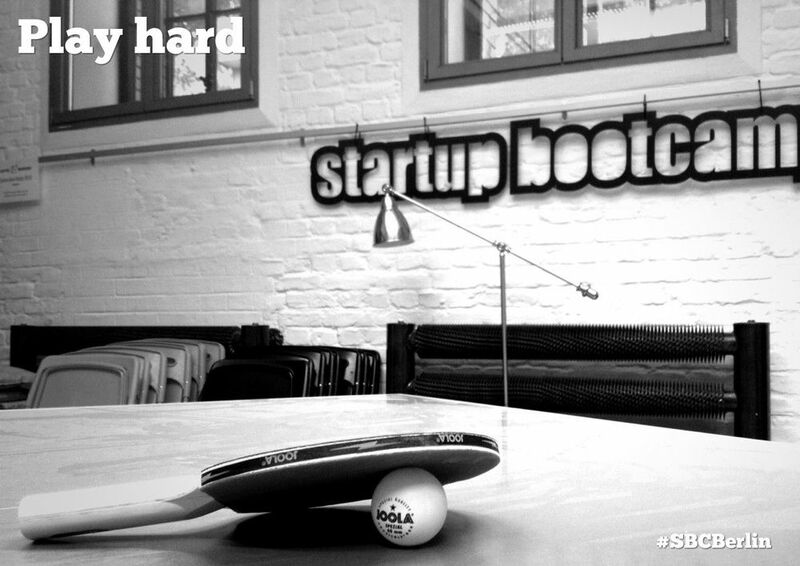 Startupbootcamp Berlin is based at Rainmaking Loft Berlin, Charlottenstr. 2, a lovely coworking space. Visit the Rainmaking Loft and get a tasty coffee from Aaron @Le Labo. The single most important reason to join an accelerator is that you get 5 years of business studies in a 3 month acceleration period. Accelerators are the business school of the 21st century. I found that I grow my personality exponentially by starting my own startup and becoming part of an accelerator. It's huge in value. (Disclaimer: Not necessarily for your first startup, but definitely for your whole career). Successfully passing selection days, 11 startups started their Startupbootcamp journey on August 13th. You can find a list of all startups here. I don’t know the official number, however successfully passing probably means beating odds by 1 to 10. Fact: On average over 70% of our program graduates have gone on to receive funding for their projects. The program: Shape, Build and Sell. The program consists of 3 stages: Shape, Build and Sell. Shape: Startupboocamp makes sure that you are working on the right idea. Up to 50% of the startups pivot during the program. In that stage, startups are extensively exposed to partners, potential clients and mentors. Build: Most startups obviously come into Startupbootcamp with an alpha or beta product. If not, they need to get their idea into a product. Early customer feedback is crucial. Some have already launched their product publicly and directly work on customer development. Sell: Startupbootcamp encourages each team to be in constant contact with their customers. Startupbootcamp strongly believes in building businesses solving real problems that customers want to pay for now. Entrepreneur in residence help each team in coding and designing websites, customer acquisition, fundraising, sales and marketing. There are more mentors and experts from energy & transport. Daily delicious lunches are cooked. PS: Link to Martin Holzmeister portfolio website. Get mentors and advisors early on whom you can trust fully. Don’t find the brain drain. Accelerator programs are designed to make entrepreneurs exhausted. But your learning is 100x higher than not being accelerating. —Über den Autor: Danny möchte Studenten & Absolventen durch StartupGeist - Blog & Podcast - helfen, ihre unternehmerischen Träume zu entdecken und diese fokussiert und produktiv zu realisieren. Entdecke auch du deinen StartupGeist und hole dir eines von Danny's 5 eBooks.